There's a great little Italian delicatessen near us that has a wide array of fresh and flavorful foods. We enjoy going to see what they have out for sampling and bringing it home to create a dinner. 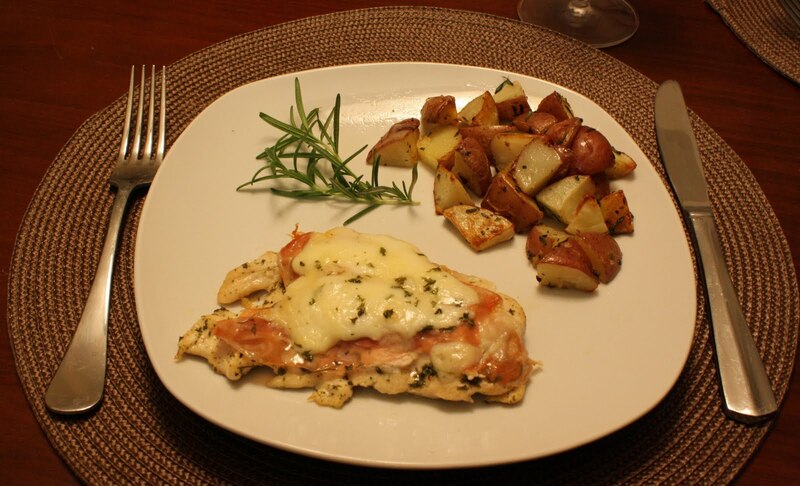 This prosciutto manchego chicken is what we came up with this week. The rosemary potatoes are an easy go-to side that pairs really nicely with just about everything -- and they're easy, too! They need a bit more time than the chicken so it works well to throw them in the oven while preparing the rest of the meal. Heat enough olive oil to cover the bottom of frying pan. On medium heat, add garlic, 1 tbsp. parsley, salt and pepper to olive oil. Sear chicken on each side until it has turned slightly golden brown. Place pan seared chicken in a baking dish. On each, put 1 tbsp. ricotta, topped with the prosciutto slice. Add both cheeses and remaining parsley on top. Bake for 20 minutes, uncovered, until the cheese is bubbly. Chop the potatoes into bite-sized pieces and place on baking sheet. Drizzle with olive oil and add rosemary, salt and pepper. Use a spatula to toss. Bake for 40 minutes, removing 2-3 times to flip potatoes. You may want to broil for the last 2 minutes to get the outsides nice and crispy.